The recent advances in the stock market have led to an explosion in articles contending that we are in a new stock market bubble or mania. Some analysts are seeing a parabolic peak already. Almost everyone seems to agree that some market decline should come any day now. The number of references to “bubble” on Twitter has also gone up significantly, as was pointed out in this article. We all know how a parabolic peak, typical for speculative manias, looks like. The chart just shows a faster and faster appreciation, until it goes almost vertical. It’s easy to see how the rate of change accelerated twice, until it became unsustainable, and then the inevitable collapse after the year 2000. This is not a parabolic peak at all. If anything the rate of change has decelerated noticeably since 2011. 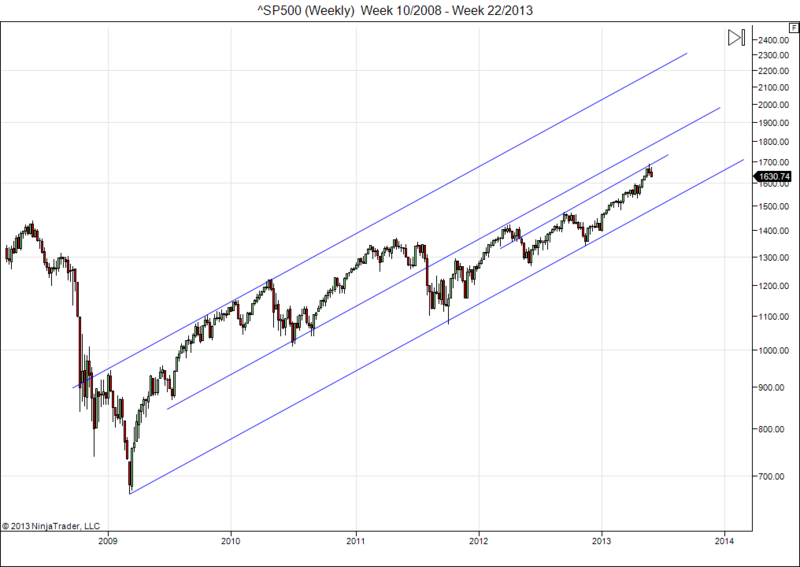 In fact the S&P is still near the bottom of the trend channel it has occupied since 2009. That doesn’t mean it has to keep rising within this channel forever, but unless we get a drop below the support line (currently ~1500) it can keep going for quite a while. 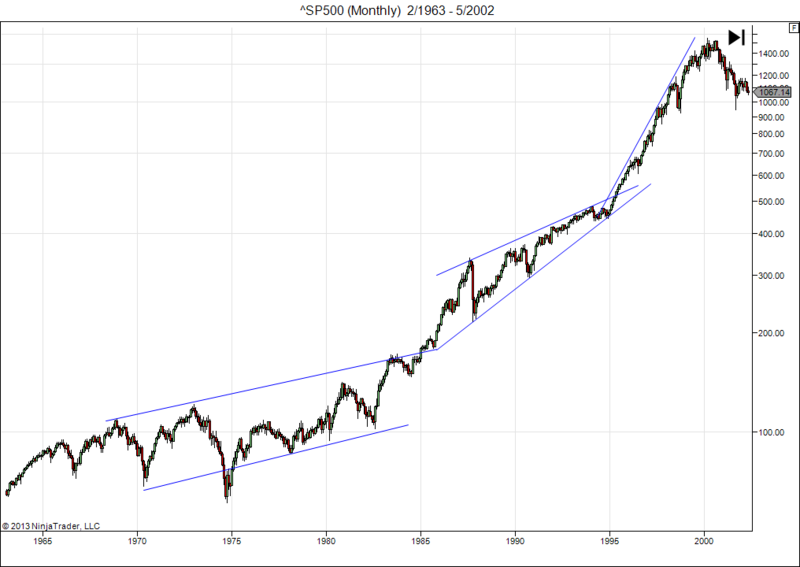 If it does so, then I would look for the market to reach the mid line by summer, which would be around 1800. The mid line is likely to put up serious resistance, so look for a meaningful correction if the S&P gets there. Is there any precedent for this kind of scenario? Well yes, it’s the one scenario you never see mentioned anywhere in comparison with the current times: the roaring 1920s. 2) Investors had suffered 50% losses twice within a decade, just like investors have burned their fingers twice in the 2000 – 2010 period. When investors have recent memory of painful losses they become very skeptical of any new market advance, and this sets the stage for a long bull market. 3) By 1923, two years after the bottom, the Dow Jones had recovered most of the depression losses, and by 1925, four years after the bottom, it was pushing into new highs. 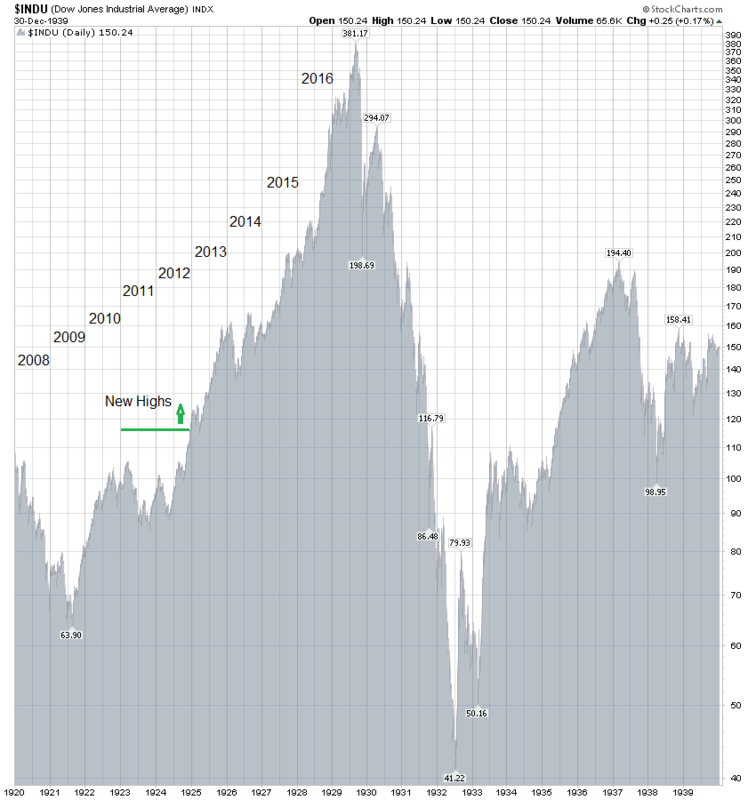 The current market playbook happens to be very similar, markets have pushed into new highs four years after the bottom. 4) What fueled the market? Well, besides ongoing innovation, the Fed also increased the money supply by 60% in the mid 1920s, with the aim of keeping interest rates low, not unlike the current QE programs. That money had to go somewhere, and apparently started flowing into stocks at some point. 5) We know what happened next. Most investors had probably remained scared, scarred and skeptical, even when the market was setting new highs every day. Then they started buying stocks in 1928 and 1929, and that made for the parabolic peak, almost eight years after the bottom. A similar scenario now would point to a peak in 2016/2017. I have added the current years to line up the historic comparison. Notice how once the market moved into new record highs, there was only a brief correction and then the market kept grinding higher for almost a year without any serious pullback. Is the same happening again now? We will know by the end of the year. Up to now there has been a 0.81 correlation between them. We will see how it continues. I think the current high levels of ongoing skepticism, and all the talk about bubbles, are actually lending credibility to this scenario. And the ongoing QE programs around the world are known to come with a high risk of igniting another stock bubble. Bear in mind: history does not repeat, but it tends to rhyme. The market action in the early 1920s rhymes well with what we see currently. The question becomes: when and where will the rhyming stop? Are we setting up for a great depression in the 2020s, or will the rhyming stop well before then? This entry was posted on June 2, 2013 at 9:46 am	and is filed under Market Commentary. Tagged: Dow Jones, Great Depression, Market trend, Quantitative easing, Stock market bubble. You can follow any responses to this entry through the RSS 2.0 feed. You can leave a response, or trackback from your own site. Liked your post. The crash will come one day but still too much doom and gloom. Right. And crashes rarely come when a lot of people are calling for one. I have added a comparison chart. In the 1920s there was a peak in the 53rd month of the recovery, followed by a 15% drop. 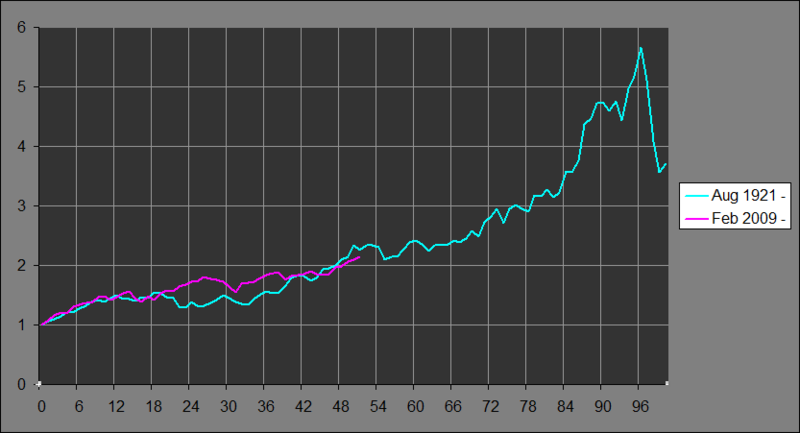 We are now in the 52nd month of recovery, so if the markets holds up into July then it could become interesting. Thanks. That system seems to give a lot of false warnings or very early warnings. It reminds me of that analyst who predicted 15 of the last 3 recessions. Methinks its remarkable post-prediction (most of the 20th Century major collapses) is a rather incomplete approach and may be capable of predicting highly critical market conditions that may or may not lead to collapse. A missing determinative factor that Sornette does not account for (and it is highly complex) may be the effects of solar/lunar activity.